You absolutely cannot go wrong with this fish cake recipe. I make these fish cakes with leftover fish, though you can also poach the fish and allow it to cool. Likewise, you can use leftover mashed potatoes, but it is best to use chunky mash. Preheat the oven to gas 7, 220°C, fan 200°C. Put the potatoes in a pan of cold water, bring to the boil and cook for 15 mins. Drain; set aside. Wrap the cod loin in a foil parcel. Place on a tray and bake for 8-10 mins or until cooked through and the fish flakes easily. Mash the potatoes with a fork. Add the pesto and herbs; season, then flake in the fish. Tear the mozzarella into 2 equal pieces then mould half the fishcake mix around each piece, ensuring the cheese is encased. Chill for 15 mins. Put the flour, beaten egg and breadcrumbs into separate bowls. Roll each chilled fishcake in the flour, then the egg and finally the breadcrumbs. Heat the oil in a pan over a medium heat. Fry the cakes for 2 mins on each side until golden. Transfer to a tray and bake for 15 mins. Mix the mayonnaise and mustard. 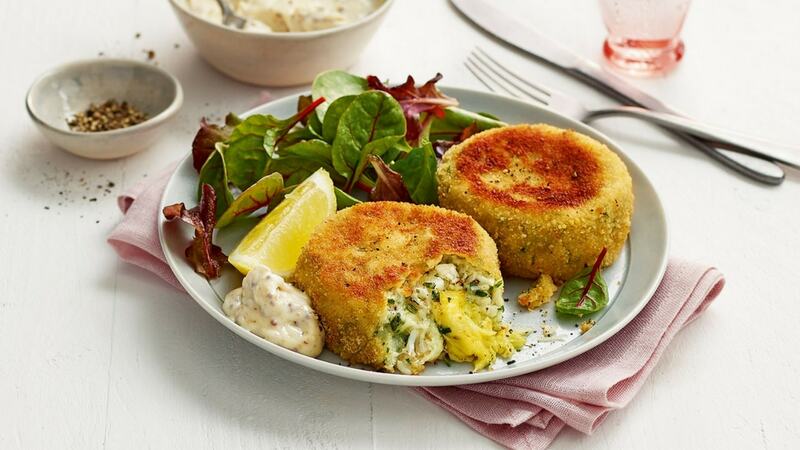 Serve the fishcakes with the salad leaves, mustard sauce and lemon wedges. Try not to skimp on the chilling time – it helps the fishcakes hold together during cooking. Wholegrain mustard is great in salad dressings, glazes for grilled meat – especially lamb – or mixed with mayonnaise for a punchy dip for crisps or raw veg. Preheat the oven to gas 7, 220°C, fan 200°C. Put the potatoes in a pan of cold water, bring to the boil and cook for 15 mins. Drain; set aside. Wrap the cod loin in a foil parcel. Place on a tray and bake for 8-10 mins or until cooked through and the fish flakes easily.